This week’s Arrow was a singularly fantastic episode, perhaps one of the best of the series. That’s not hyperbole either. This episode brought together all the elements that make Arrow great and even gave us something new to love: a strong family dynamic. And, shock of all shocks, I loved it. The day starts with all kinds of technology malfunctions across town: car accidents, hospital equipment backfiring, elevators shocking people (including Captain Pike)... even a plane crash. It’s Cayden James demonstrating his power. Meanwhile at the Queen’s apartment, we are treated to the most adorable domestic scene. Oliver and William are having an arrow shooting contest using suction cup arrows. William is a natural and even bests his father, which he gloats about. Oliver is very obviously proud. I’d say the kid is poised to take over for his dad someday. Hopefully far in the future. Felicity joins them and she and William discuss some schoolwork that goes rather adorably over Oliver’s head before William heads off for his field trip. That leaves Oliver and Felicity to exchange a good morning kiss — something much appreciated by the fans. Of course, after that, the news of the day catches up with them and Oliver needs to rush off to deal with the fallout while Felicity heads to the bunker to see if she can find out what’s going on. At the bunker, Dig is training hard now that the chip is working. He’s feeling better and stronger than before. Felicity fills Dig in on what’s going on and then when Oliver is roped in, Dig brings up the idea of looping in the newbies — just so they can put pieces and knowledge together faster. It’s a smart move. At the precinct, Oliver talks to Quentin, asking him to fill in for Captain Pike. Meanwhile, at the NTA Lair where the bitter are still bitter, Curtis answers a call from Felicity and she mentions putting their heads together. NTA agrees and when one of Curtis’ t-spheres comes to life, they realize it’s locking onto Vigilante’s visor again. Dinah suggests they use it to trap him, which just seems too simple. But what do I know. So they get their super suits and head out. Thea rushes into the precinct and Quentin fills Thea in on what’s going on, promising to help in whatever way she can. She suggests setting up off-grid safe zones for people to hide out in until the crisis is over. Oliver goes to City Hall while NTA hunts down Vinnie. Vinnie confronts Curtis, telling him that he’s undercover with Cayden James. But Curtis isn’t buying it, and neither am I. Vinnie then asks for Curtis’ help and tells him to go to the subway tunnels: to save some lives there in an hour's time. Meanwhile, Mayor Queen is addressing his staff about the crisis and the death of a councilman when Cayden James shows up. He gives the absolutely fantastic fake name of “Ben Gale,” which is the most brilliant Lost reference I’ve ever seen in a show. Anyway, he’s there to tell Oliver what he wants from him. He’s got control of the city’s infrastructure and wants money — lots of money. $10 million dollars to be exact, by that night and every night afterward. Oliver says that will bankrupt the city. Cayden doesn’t care, and wants him to suffer. Oliver insists he didn’t kill his son but Cayden insists that he did — one year ago today to be exact when he accidentally shot him. Something about that is weird. Oliver doesn’t miss a shot. Ever. At the bunker, Felicity is working away, trying to find a way to counterhack Cayden James. But she can’t. She learns from Alena that Cayden manipulated her several episodes ago, getting her to help him load up a virus, which is what allowed this whole sequence of events to happen. Oliver shows up and tells them about Cayden, his demands, and his insistence that Oliver killed his son. NTA calls up Felicity to share some intel, asking her to look at the subway where the systems have gone offline. She offers to help Curtis get it online but he cockily tells her that they can handle it without her help. But Felicity notices that Cayden is shutting down all access in and out of the city. Which means that William’s school bus is stuck in a tunnel. On the bus, William is being taunted by some bullies (they give him crap about his mom being hot which... I can’t argue that. Felicity is pretty fine) while Oliver and Dig suit up to go save William. NTA is dealing with the subway thing but honestly, after Curtis’ rudeness to Felicity I don’t even care. Surprise, surprise, Curtis is unable to fix the issue on his own and Dinah has to use her cry to stop the subway trains from colliding. Dinah has her faults in this all, but she deserves a better team. Back in the tunnel, the gas lines blow and the kids on the bus are panicking. William keeps a level head, getting all the kids out the emergency exit at the back of the bus. On the way out, he gets trapped behind a fallen sign. Oliver and Dig arrive and Spartan helps all the other people get out of the tunnel while Oliver goes to look for William. He finds him and frees him from behind the sign. They hurry to safety before the tunnel is engulfed in a fireball, but now William knows that his father is suiting up as the Green Arrow — something he promised him that he wouldn’t do anymore. Whoops. Oliver and Dig bring William down into the bunker and he has a look around. He’s pretty upset with his father for being the Green Arrow again. Oliver doesn’t really have an excuse, he feels he has to be the Green Arrow right now. William is clearly hurt, but Oliver doesn’t have time for a discussion. He has to go meet Thea and asks William to hang at the bunker until he returns. NTA, meanwhile, is feeling super cocky and I can’t wait until they’re knocked down about fifteen pegs. Curtis tells Dinah that he got the information about the subway from Vinnie; she and Rene are both pretty annoyed about that fact. Curtis tells them that Vinnie claims he’s a double agent, but Dinah doesn’t really believe that. She’s adamant about not working with Vinnie again and lets them know this in no uncertain terms. Thea and Quentin want to help people but no one is showing up at the safe zones; they’re all too scared. Oliver has an idea though. Back at the bunker, Felicity is talking with Alena who believes that Cayden was sent faked evidence that Oliver killed Cayden’s son. They just need to track the evidence — a USB drive — and find who sent it. Dig, meanwhile, is disappointed that he’s not back under the hood. He wants to be the Green Arrow, partly for William’s sake. Felicity feels bad for the boy, but is unsure what exactly to do. She’s still learning how to be a step-mom. Oliver is on television, holding a press conference — telling the public what is going on, who is doing this to them, and urging everyone to go to the safe zones. Unfortunately, Cayden is entirely expecting this turn of events. Oliver returns to the bunker and Felicity fills him in on what she’s learned about the evidence that Cayden has. Oliver does a pretty good job at looking like he understands her mile-a-minute babble. William is still sitting alone, sulking, and she says he should go talk to him. He will but he’s not quite ready yet. Felicity gives him a bit of a pep talk about dealing with William. She tells him that the thing that hurt her the most about her relationship with her father growing up wasn’t so much the bad that he was doing, but that he didn’t tell her about it. She didn’t like the lies. She believes William can handle the things that Oliver has to do so long as Oliver is telling him the truth about them. Elsewhere, Dinah is still ticked at her teammates and they tell her they won’t work with Vinnie if she doesn’t want to. They agree to discuss it reasonably. Vinnie signals NTA with Morse code to the t-sphere, telling him that Cayden and his crew are going to attack one of the safe zones that Quentin and Thea set up. Dinah agrees they should suit up and head out. They show up at the safe zone and are joined by Dig and Oliver, who were alerted by Curtis about what was happening. This one time they agree to work together. And right on cue, Cayden’s crew shows up with guns to terrorize the citizens. The heroes drop in and engage the gunmen while Felicity and William watch from the bunker. Actually William is nervous, concerned for his father. She gives him this great speech about how Oliver does what he does, why he does it… but how she loves him anyhow. Because there’s no guarantees in life, especially this one, but it’s worth it to help. This wonderful speech is intercut with shots of the team fighting the gunmen and it’s really rather stunning. Vinnie saves Rene in the field and Dinah sees it. And William starts to get perspective on why his father does what he does, and how important it is to have faith in those we love. THIS right here is why I love the show. NTA lets OTA know that nothing has changed before everyone stalks off to their own respective corners. Back at the bunker, OTA can’t help but notice that they don’t know where NTA got their intel about the raid. Oliver goes to talk to William while Dinah meets with Vinnie and thanks him for the help. It looks like they’re patching things up. At the Queen family apartment, they’re having a family meeting. Oliver apologizes to William for lying and promises that there will be no more secrets and no more lies. He says if William wants him to stop being the Green Arrow, he will. William tells Oliver that Felicity showed him what he does and the boy gets that the city needs him to be a hero. Plus, he’s not as worried about being an orphan now: he has Felicity. That’s pretty fantastic and just about everything I’ve wanted from this little family. I may even have had a tear or two in my eyes. Oliver and Felicity share a sweet, tender moment before Alena interrupts with a text, telling Felicity that they were unable to find out who sent Cayden the evidence. And Oliver has to get to City Hall. Cayden’s deadline looms near and he’s decided to... pay him. That just seems like a really, really bad idea. He promised the city he wouldn’t negotiate with terrorists. And here he is, caving to those demands. This was a great episode, solid from start to finish. Yes, the newbies are continuing to be super annoying. But I think it’s beyond apparent by now that their overconfidence is a house of cards and that will come tumbling down soon. They’re cocky and arrogant and that will work against them. The only questions are how and when? The rest of the episode gave us a blessed lack of Black Siren (and so Quentin and Thea weren’t weighed down like last week) and a lovely abundance of Felicity really getting into the groove of being a step-mother. 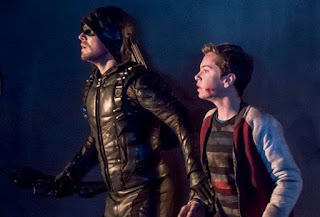 Plus, Oliver is no longer lying to his son about being the Green Arrow so that is also a good development. If only all Arrow episodes could resonate like this one, we would be a lucky fandom indeed. Join me next week when we watch “All for Nothing,” which sounds more than a little ominous.